March means that Autumn has finally arrived here in Australia and I must admit, Autumn is my absolute, most favourite season of all. Crisp in the Fall is a project which I created back in 2014 for an issue of Patchwork & Stitching Magazine. 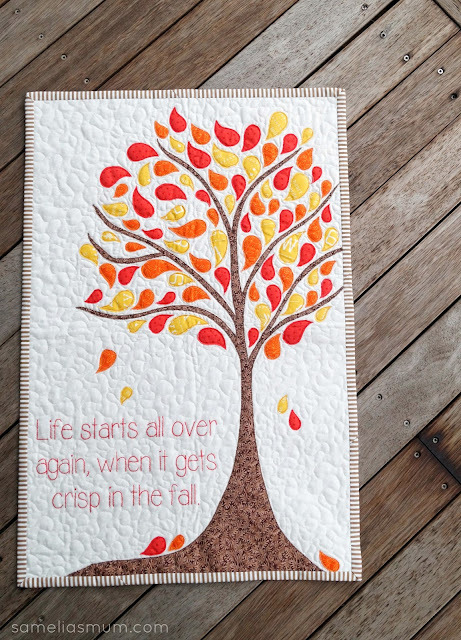 It’s a good size wall quilt which i personally hang on my wall at the start of every autumn. As I was unpacking it from my quilt cupboard, I thought I’d give some Autumnal love and share the pattern here with you today. It’s quite a simple project to create and a good way to use some favourite scraps of fabric. I’ve used mainly orange, red and yellow for the leaves, but you can use any fabrics you like. The embroidery was completed in a simple back stitch but a stem stitch would be just as lovely (if not even lovelier). I originally used a basic font and always regretted using a cursive font for the wording, so I’ve updated the word pattern using the font called Alex Brush in size 110. If you’re not a fan of the cursive writing, just highlight the text and choose another font. The main thing to think about is that the writing has to fit into that little space on the lower left half of the quilt. Now the tree… when I made this pattern, I sent the publisher the drawing of my tree across (4) sheets of A4 paper taped together. As I have no idea how I would scan this and share digitally, I am leaving the tree up to you. It’s not a difficult design and I encourage you to draw it free hand on the back of your fusible paper (paper on the roll rather than A4 sheets). If you’re not going to use fusible paper on your applique, draw the basic shape on the back of the fabric, the cut free hand. A lot of the tree is covered with the leaves, so if you make a little mistake, you can always hid it with a leaf or two. 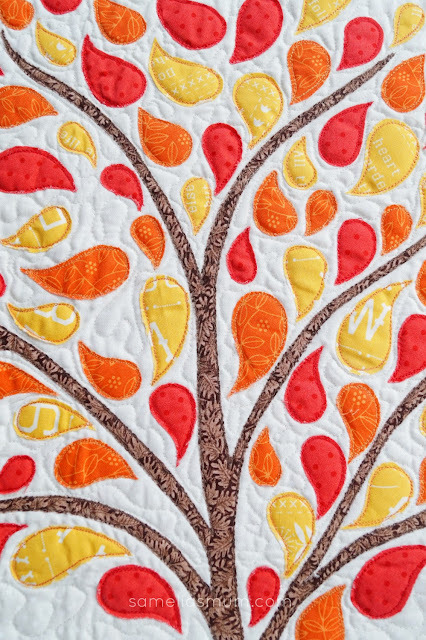 As always, if you create your own Crisp in the Fall - Wall Quilt, I would absolutely love to see it. Feel free to email me a picture or tag me on social media if you’re sharing it there. It makes my day to see you projects created in your style and fabrics. What a beautiful quilt. I miss autumn now we live in the tropics, it just has its own special smell and feel. Thanks for sharing. Yes, it does have a special crispness about it. Not sure how'd I'd cope in the tropics - it's about 90% humidity here today and I'm melting.